ClubCoins Needed: 50 Please note that this item is not available on your device. You may add the item to your Wish list and redeem from a compatible device. Despite our ever-increasing reliance on mobile technology, most people spend at least some time during the week at a desk. Being organized and effective at your desk can make a dramatic difference in your productivity and promotability. 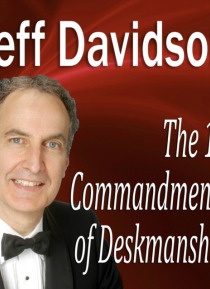 In this revealing program, author and professional speaker Jeff Davidson discusses the ten commandments of deskmanship that first appeared in his book Breathing S… pace: Living and Working at a Comfortable Pace in a Sped-Up Society. In clear and everyday language, Jeff lays out ten tips for taking control and being at your best at your desk. He explains the value of clearing your desk every night, refining what goes on your desktop, refusing to use your desktop as a filing cabinet, predetermining what goes inside your desk, and keeping 20 percent of your desk or workspace vacant. He also discusses the value of using your surrounding office to support your desk, taking comfort at your desk, keeping your desk area clean, leaving your desk periodically, and honoring your desk as you would honor yourself. After listening to this session, you won't approach your desk or workspace in the same way. You'll be excited about the changes you can easily implement that will all but guarantee that your workdays will be more enjoyable and more productive.